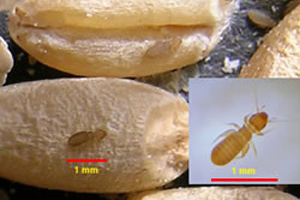 Booklice found inside homes are wingless and very tiny: less than 1/16 of an inch long. While their back legs are thicker than the other four, and resemble the legs found in jumping insects, booklice do not jump, but run about rather quickly. Adult booklice range in color from translucent white to gray or brown. Females can produce about 60 eggs during the warm summer months and their life cycle (from egg to adult) can be completed in less than one month. When cool temperatures prevail, female booklice produce fewer eggs and the time required to complete their life cycle is over three months. Females deposit their eggs singly and often conceal them by covering with debris. Booklice undergo simple metamorphosis that is their nymphs look just like adults except that they are much smaller and sexually immature. The common house-infesting booklice normally have four nymphal stages. The best way to control booklice is to eliminate moist environmental conditions. Reducing the humidity in your home will eliminate the mold on which the booklice feed. Lowering the relative humidity to less than 50% will prevent their development. An air space under potted plants on windowsills will help keep the humidity down and reduce mold growth. Throw away any infested food material and make sure other foods.